There comes a time in every person’s life when they are just fed up of wearing the same old clothes and desperately wish for new ones. However, in order to make room in your wardrobe for all of your brand new threads, you’ll need to get rid of the old ones first. No doubt you’ve heard of the saying, out with the old and in with the new? Well I am going to show you just how you can do that and help the environment with five eco-friendly ways to recycle your old clothes. It may sound obvious but one way you could put your old and unwanted clothes to good use is to donate them to a charity shop. By doing so, somebody else will be able to make good use out of your old clothes and you will create sufficient space in your wardrobe and drawers to put your new purchases. The great thing about donating to charity is that you will be helping a good cause and someone else will be able to get their hands on top quality clothing for a fraction of the usual cost. Just make sure your clothes are still in tip-top condition before you bag them up and take them down to the store. Nobody will feel inclined to buy dishevelled clothing that is ripped or stained. Your clothes don’t have to be damaged or necessarily old and worn for you to want new ones. Sometimes you may have been given clothing as a gift and you find that you don’t like it or that it doesn’t fit you. Rather than seem ungrateful, graciously accept the gift in the knowledge that it will come in handy for your next clothes-swapping party. Invite all of your friends round to your house and tell everyone to bring an item of clothing or some accessories that are unwanted but still in great condition. Then take it in turns to pick out an item from the pile. You may find that your best friend has a gorgeous green dress that suits you while she may covet those red beads that you no longer wear. Perhaps your old M&Co blouses have seen better days but you just can’t bring yourself to throw them away? In that case, you will be pleased to know that you can take cuttings from your old clothes and fashion them into fantastic new pieces. That sheer blouse that you love the colour of can be used to make a sheer denim button up tank top. Simply chop the sleeves off your old, non-fitting denim jacket. Next chop your jacket up just below the front jacket pocket flaps and retain the button section but discard the rest of the jacket. Chop off the top section of your sheer blouse from underneath the arm upwards and se to the top of the denim jacket. Finally sew on the button section to complete the top. Another ingenious way to pass on your clothes, i.e. 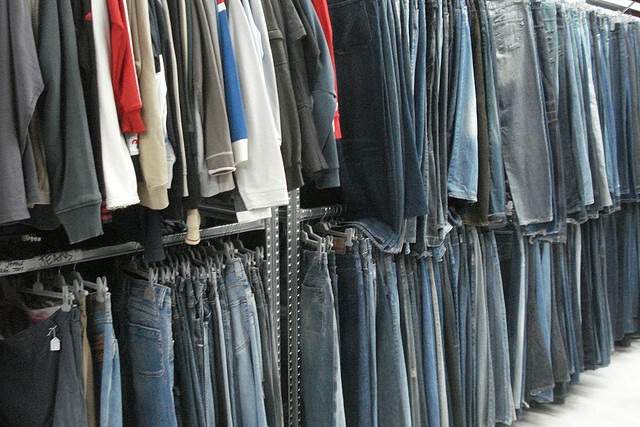 recycle old clothes, which will make you a bit of money at the same time, is to sell them via an online marketplace. You may not fetch an awful lot of money for your old and unwanted clothes, but you will be doing your bit for the environment and at least someone else will have the opportunity to wear them, rather than having old clothes cluttering up your drawers at home. On occasion you will have a collection of old clothes that are so worn and tired that they are unsuitable to be sold on or given away to charity. In such circumstances, you can still re-use your old tops as cleaning rags. Simply cut them up into medium sized pieces and you will save money on having to buy expensive and overpriced cleaning cloths.